8 oz of superwash Corriedale top. Can you say socks? 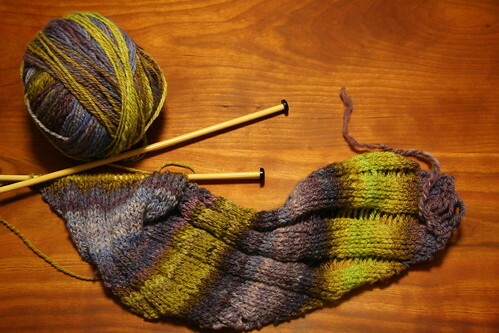 I love the colors, and have great plans in mind for the 3-ply yarn I want to end up with. I signed up for the doubles option, so instead of getting 4 oz, I got 8 oz. I figure that should be enough for some serious socks. I can't wait to get started on it, but it will have to wait until I finish the Wild Raspberry Targhee that is currently on the bobbin. There has also been some serious work on The List. I finished one entire Endpaper Mitt (sans thumb ribbing) and discovered that, while it fits me perfectly, it is a wee bit large for its intended recipient. My gauge was only off by 0.5 stitches per inch, but over 56 stitches, it works out to 7.5 inches around instead of 7. My Fair Isle gauge is definitely looser then my non-stranded gauge. I loved the pattern, and it went incredibly quickly. I went down a needle size on both the ribbing and mitt (from 0 and 2 down to 00 and 1), and the new version (not pictured) seems to be the right size. Hopefully those will be done by next week, but we'll see. Progress is also being made on Mr. Redjeans, but the pictures wouldn't be terribly interesting, so I'll save it until the body ribbing is done. Two sets of Fair Isle alpaca mitts - need to be designed and knitted. And by designed I mean Fair Isle chart lifted off the internet and incorporated into an already existing mitt pattern. And D-day is only 5+ weeks away. I'm not sure whether to panic or be happy I've got this much done so far! Other progress: HY Fiber Club October offering is spun, plied and drying. Hopefully I get together the summary post today (as long as I get home to take pictures before the sun goes down completely). Plain stockinette socks - one almost to the ribbing, but they're size 11.5!